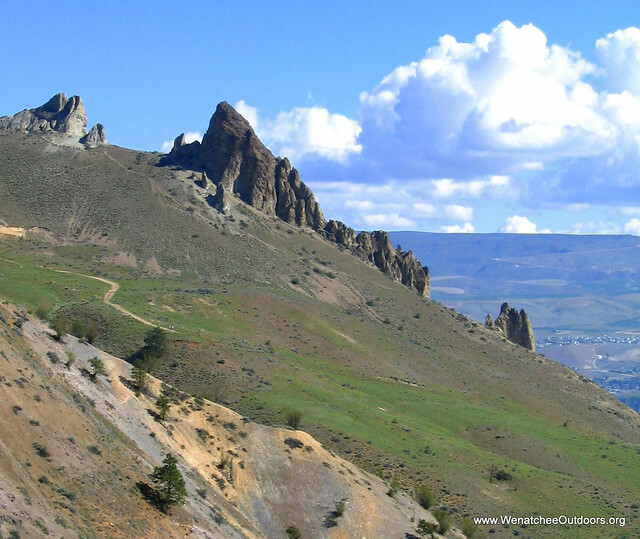 Success–Saddle Rock is now a locally owned park! We reached our Campaign goal of $912,000, including the full stewardship amount of $382,000! The 325-acre property has officially been transferred to the City of Wenatchee. The City owns the land, and it is permanently protected by a Conservation Agreement between the Chelan-Douglas Land Trust and the City. Dedicated stewardship dollars will ensure better maintenance of the area without the City incurring additional expenses. Local ownership means that we can now work on addressing long-standing parking needs. Permanent protection of this treasured icon means our community can continue to enjoy Saddle Rock’s open space, recreation, and use as an outdoor classroom for schoolchildren for generations to come. Over the years, Saddle Rock has been over-loved and under-maintained; it needs significant restoration and care. Through this partnership between the Land Trust and the City, restoration and stewardship dollars will ensure better maintenance of the area without the City incurring additional expenses. While the development of a trailhead is not part of initial plans, CDLT and the City will explore grant opportunities and partnerships for a public trailhead and maintenance. This purchase was the first step in a multi-year effort to implement the Wenatchee Foothills Community Strategy, a proactive approach to conserve and steward those properties in the foothills which have the greatest conservation qualities and are most appropriate for public trails.